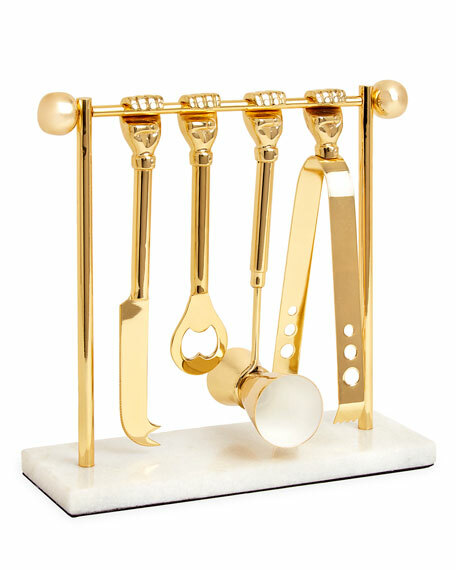 Barware set crafted of polished cast brass with food-safe lacquer. 9.25"W x 3.75"D x 9.5"T.
Includes ice tongs, bottle opener, double jigger, and knife. Wine system features a soft-touch grip and premium Coravin capsules. Lets you pour wine effortlessly without removing the cork so you can enjoy the rest of the bottle another day. Nylon, ABS, synthetic rubber, polyurethane, and stainless steel. 5.5"W x 3"D x 8.5"T. Do not submerge in water. Coaster set made of oxidized, nickel-plated, and gold-tone metal. Includes six 3.75"Dia. coasters and one 5"W x 4.25"D x 2.5"T caddy. Wipe clean with soft, damp cloth. Imported.